AFRICANGLOBE – There are many new books on World History, which try to explain why some Nations fail and others succeed: FukuYama’s “The End of History And The Last Man ”, Andrew Marr’s “Making of Modern Britian ”, Pankasls Mushrab’s “From the Ruins of Empire ”, Ian Morris’ “Why the West Rules— for Now ”, Daron Acemoglu and James Robinson, Dan Broidy and so on. These books have developed general theories to show that societies which develop the ability to live together, to cooperate towards a common purpose and to communicate, are orderly and can advance beyond those that cannot. The practical results of that organization have been clear: heavy industry, shipping, banking, effective taxation, etc. Not forgetting the ability to effectively wage war. It is generally believed that several World societies in the 13th, 14th and 15th centuries were roughly at the same level. However, during the 16th century, as the idea of a Nation State took a firm grip of Europe, other contemporary, previously far more civilized kingdoms and empires – Ottoman, Chinese, Mongolia, Thailand, Vietnam, Japanese, Benin, Oyo, etc. began an inexorable decline. There were other indications of the arrival of the Nation State, these include Martin Luther questioning transubstantiation, the beginning of the demise of divine kingship, the expansion of representational Governments and so on. These were concrete examples of the idea that such nations were better organized civil and religious societies, capable of good communication with efficient collection of taxes, and the invention of better means of transport and destruction (guns). Their inventions led to electricity, mass production and the making of the industrial revolution. Even the study and understanding of this concept was a further indications of the new world order underpinned by philosophical writings of Hobbes, J.S. Mills, Locke, Burke and a host of others. The influence of a single idea, free trade, aligned with the single minded pursuit of this ideal of a nation state led to the search for cheap raw materials and then the markets in which to sell produced goods. This singularity of purpose, in a nation state with the industrial wherewith all was probably responsible for the conquest of India, The Far East, Africa and the Caribbean. The discovery of the Internal combustion engine driven by coal, then later, oil and the invention of mass-produced steel allowed ships to travel the world over as they had never before. Simultaneously this world system now followed the doctrines of Darwinism – that all species were perpetually fighting against one another and the world only had space for the survival of the fittest. Unfit species were gobbled up by the fittest and science was the food to conquer all nature. Through science, a regime of super fit individuals and countries would inherit the earth, thus creating the dominance of secularism over the prevalent religiosity. An economic system allowing for the accumulation of capital through stocks for the development of markets required the introduction of new goods to be brought and sold to keep that commerce vibrant and profitable. Goods made from sugar, corn and later cotton were the answer but at what price? 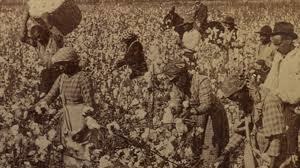 Thus the Slave Trade and slavery contributed to the Wealth of Nations through the production of sugar, cotton, tobacco, coffee, and maize through a seeming endless supply of cheap labour. These factors helped France, UK, Germany, Belgium, The Netherlands and, of course, the U.S. grow economically, socially and politically. Forty million souls left Africa in a century and half for the new world bearing a dramatic effect on global demography. The effect on the African continent of the loss of 40 million people has no parallel in history. True, the Jews lost six million people in the WWII (for which reparations are still being paid! ), Asia lost 24 million, USSR 20 million but for a number of different reasons these places have now developed beyond those losses. What now Africa? What did the slaves go to do in these new Worlds? Wrong question. The real question is what was the result of this mass migration? A migration that moved 40 million souls over 150 years based on a belief in the racial superiority of one group over another. It is true that there was slavery everywhere in the world but not that it was so clearly identified with racism – until the African slave trade. This was a new phenomenon and on an unprecedented scale. To codify and justify this White Supremacy over Black, Yellow and other races became the basis of International Relations from the 16th century onwards and very largely still is today. The success of these enterprises have never been fully understood nor appreciated in relation to their contribution to the wealth of the United States and the West and, conversely, relative to the non-development or under development of Africa, Asia, etc. Just Sugar alone had an enormous impact on the development of the Western Nation States’ economies, social life and physiological make up. Sugar alone was major industrial component of industrial starch, a vital necessity to all chemical, pharmaceutical, and food industries in the world. Sugar changed eating habits of Europe and America from 17th century till today, contributing to major pharmaceutical progress, chemical and food industries, preservatives etc – a change which no other single crop has achieved in world history – not even banana or wheat. In France the capital from West Indies sugar plantations was responsible for the major breakthrough in gun technology which itself was responsible for the incredible military feats of the Napoleonic age. Sugar in U.S. Industry alone provided wealth totally unknown before in the U.S. The tobacco industry grew on this wealth that was further propelled by maize (corn) and the daddy of them all – cotton. The conjunction of the contribution of sugar, maize, corn, and cotton penetrated business to the extent, which even oil, gold and diamonds were never able to do. Tobacco changed the social habits of the U.S. and Europe and cotton their dress style. It is hard to imagine the typical western life today without cheap Sugar, Cotton, Coffee and so on! In time rubber, palm oil and groundnut oil and other commodities could be added to the list. In addition, the need to secure and protect this trade and its proceeds encouraged engineering: ship building, technology, navigation, armies, navies, etc.